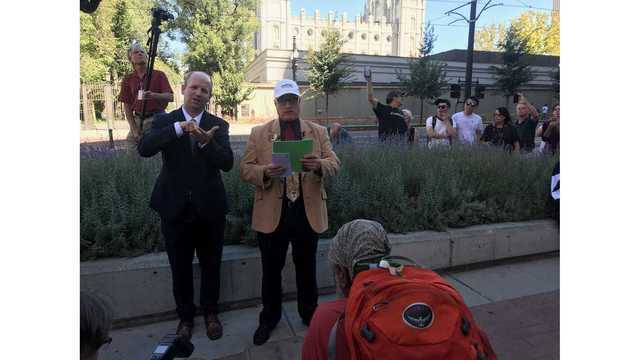 SALT LAKE CITY, Utah (News4utah) - Sam Young held a press conference Sunday where he announced that he has been officially ex-communicated from the Church of Jesus Christ of Latter-Day Saints. Young, the founder of Protect LDS Children, received a letter on August 28th that a formal disciplinary council would convene on his behalf. The letter told Young the council could result in "the possibility of excommunication, disfellowshipment, formal probation, or no action. The reason for this council is that you are reported to have acted repeatedly in clear, open, and deliberate public opposition to the Church or its leaders." Earlier this week, Church leaders delivered the verdict letter to Young's business in Houston, and at Sunday's press conference, he read aloud this verdict for the first time. Young went on a 23-day hunger strike back in July and said he is calling for church leaders to end one-on-one ecclesiastical interviews between bishops and children, as well as the sexually explicit questions that are sometimes asked during the interviews. In an interview with News4Utah in July, Young said, "I have six daughters and four of them were asked sexually-explicit questions. That's what caused the gears to engage in my brain and say 'That's wrong for my children and sure as heck wrong, when you go to the lengths, for everybody.'" As Young attended his disciplinary council hearing in Houston, his supporters in Utah, Texas, Arizona, and Colorado say they held demonstrations to show solidarity with his cause. Earlier this month, nearly two hundred people gathered to protest the former LDS bishop Sam Young's possible ex-communication from the Church of Jesus Christ of Latter-day Saints near Temple Square Sunday. "There's some people saying, 'Oh, Sam's doing this for attention.' Well yeah, we're calling attention to something we find harmful and damaging," said Mindy Burton. "I logically understand why he’s been brought into the church council, but if you look at things objectively and see things in my eyes, we’re just standing up and supporting little kids." "It's broken some of my trust with some of the leadership. I support many things that the church does but this is an area that the church needs to look at," said Tara Tulley. Crystal Legionaires said Young's cause hit close to home for her because of the trauma and shame she experienced from her ecclesiastical interviews. She said the church's response has been disappointing for her. "How do we stop sexual assault if everyone who's calling it out gets silenced?" said Legionaires. "It shows that they are more willing to protect predators than they are to protect Sam." She said that despite the outcome of Young's status within the church, he and his supporters won't stop until something is done to better protect children in the church. "I think that if they wanted to shut up Sam, that's something that needed to happen at the beginning. It's too late now," said Legionaires. "There's so much fire to this flame and too many individuals are standing behind it that it's about standing with us and recognizing change may be hard. Change may be uncomfortable but it is a necessary change." Children and youth are precious. We share a desire to protect them, to help them grow and develop faith in the Savior, Jesus Christ and to live good and moral lives. This includes building good relationships with ecclesiastical and youth leaders who can provide support in many settings including personal interviews. The Church will continue to look for ways to guide, inspire and nurture young people by strengthening homes, providing positive role models and offering activities and learning opportunities that build character and deepen faith in Jesus Christ. Jonathan Humes, one of the protest organizers said no decision was made as of Sunday night in regards to Young's status in the church. Participants held a candlelight vigil after the protest to "remember the survivors of sexual abuse and others whose lives have been impacted by their experiences with ecclesiastical interviews."